By Reyburn Piano Service, Inc. Seller: Reyburn Piano Service, Inc.
© Reyburn Piano Service, Inc.
An excellent program providing a faster and yet accurate experience, for this aurally trained piano technician of 40 years! I’ve been using CYBERTUNER for many years now professionally. I can’t say enough good things about it and the way it makes my job easier. Thank you Dean and Nate Reyburn ! Great program! Pitch Raises in minutes, not hours, Keep the upgrades comin. Thanks! Nice! Now features Bosendorfer sub bass options too! Does a wonderful job and gets the job done. I'm a full-time piano technician with over 35 years' experience doing concert, recording, home, and institutional service in a major metropolitan area. I own every tuning program currently available for the iPhone, but this is the only one I would consider using professionally. The team of almost two dozen testers seems to have been lifted from a Who's Who of highly regarded techs from around the world. I consistently find that it helps me to tune aurally more accurately, stably, and rapidly, which means I have more time to enhance the sound and feel of my clients' pianos in other ways. Love this app! If you make your living servicing pianos this software is excellent for tuning pianos of all types. After tuning pianos by ear for over 35 years I switched to using this software and use it with my aural tuning skills exclusively even in the most critical situations. All aspiring piano tuning students should learn and master tuning by ear and this software might help there but it is really meant for the professioal tech with an esablished business. I am really enjoying the cyber tuner on my iPhone. There is no comparison between the beautiful, crisp display on the iPhone and that of my old Dell PDA. The speed of sampling, faster processor, and concert tine mode are also major improvements. I recommended it highly. I've been a long-time user of RCT, I had my own device (palm pilot) but after it failed I was hoping with fingers crossed that the RCT team would develop RCT for iphone. It's quite an investment so it was after some thought that I bit the bullet and bought the app. I am so glad I did. The new iRCT seems to work even faster and more sensitively than the original; the graphics are really clear and the app is intuitive to use. As I mentioned I was already a fan of RCT, and so am really grateful that I can use an electronic tuner that I know and trust on my iphone. One less piece of hardware to carry around, and an amazing tuning device. It's a win-win situation. Many thanks to Dean Reyburn and the RCT team for working so hard on this. Also, if any of you techs still have the little stand they made for the palm pilots, i just bent the plastic "arms" a bit and am using it with my iphone. Perfect! Accuracy, versatility and great customer service. Than the old dinosaur box of the acutuner. I'm a student of the Randy Potter School just getting my business started, and this device has been so helpful in the learning process, and in developing my ear and skills. Great quality program, very detailed, accurate and user friendly, good customer service. Would definitely recommend! Almost tunes the piano for you! So many features, it's difficult to say which makes me happiest. Add to that the program's ability to make me a better AURAL tuner....wow, just wow! This is the best software on the planet. Wow...tuners are so lucky this is available. My life is easier. I have been awaiting the release of this app for months, and it has met all my expectations. I have a dedicated iPod Touch on which it runs, and I can tune for hours without a recharge. Should I happen to forget my iPod, I can still whip out my iPhone and run it from there. The display is easy to view, and the functionality is quite intuitive and logical. With the Concert Mode, I can achieve more accurate and detailed tunings than ever before. It was very easy transferring my tuning records from my older Windows based Pocket PC through iTunes. HIghly recommended for the serious technician. I tuned aurally for 15 years before getting cyber tuner. I was developing impact trauma in my finger tips driving keys for intervals, octaves, and unisons. Many of the pianos I tune need pitch raises and I was not satisfied with the time it took or the results of aural pitch raising. Pitch raises with PRCT are faster, easier, and much less painful. Tuning chromatically, unisons as you go, allows you to use a device to drive the keys instead of your fingers. The calculated over pull leaves the piano so close to the selected pitch that sometimes all that is needed is a touch up for a satisfactory tuning. Tuning unisons as you go allows you to give more attention to unisons and tuning stability. I've tuned aurally for about 15 years, working for colleges, dealers, churches, television studios etc. In the last few years I had considered buying this app, but was hesitant because I wasn't sure how big of a difference it would make day to day. The last version of this software I had tried was on a PDA back in 2006, and prior to that I had used an old OS9 PowerBook occasionally. Neither of those solutions come close to what the new iRCT version is capable of, running on my 9.7" iPad Pro. It's fast, accurate, lightweight, and easy to see! Smart tune and concert smart tune are quite possibly the best thing that's ever happened to me! (Not really exaggerating here haha). At the end of every workday, I am thankful to own this incredible app and greatly appreciate the work of Dean Reyburn and the team of people that make this app possible. For the professional piano technician: you can do no better. This product is simply light years ahead of the competition. I switched over, and found immediate benefit in more accurate pitch raising and more pleasing tunings on short pianos. The user interface is superior also. Love the transition from RCT on my pocket PC to iRCT. I even went and bought an iPad just for the iRCT application.Been using the 4S iPhone and heard about an iPhone application being developed. Can't believe how easy the installation was and the platform is perfect for the RCT. No more cyber fork for A 440 calibration, wonderful. And at age 60 it's nice to have the larger screen of an iPad without the cumbersome weight of a laptop. File shared my saved tunings and 10 style files from my Windows Vista PC. And that was even a wonderful experience, everything came over very easily and is usable on the new platform. Thanks Reyburn team. I had this compulsion to carry a backup system with me so I lugged my old OS9 laptop along when I switched to the iPAQ. Now with the iPhone app I can finally retire the laptop (and lighten my load). RCT and iOS were made for each other. Great graphics and functionality are just the beginning. If my iPhone gets destroyed or lost, just get a new one, sync it to the desktop and all is restored! Peace of mind - priceless. FINALLY--string section/break parameters are saved for each tuning record (right in the tuning file) and are recalled and entered automatically each time a tuning is selected in Smart Tune mode (and Pitch Raise also). Piano tuning is tedious enough ;) Next on my personal feature wish list would be a scrollable index and a search box in the Open Files screen, just like it is in the Tunings screen. With a number of institutional clients with multiple (or many) pianos, it just seems to make for much better organization and usability to use one tuning file per client. Nonetheless, iRCT is a remarkable product in so many ways, and I sure don't miss the old Pocket PC/Pocket RCT... But the CyberCare subscription for $80 every year is certainly debatable, if not outright questionable, especially given the $1,000 original purchase price and the limited number of updates and feature additions. Besides, just how many truly useful features can even be added to software like this over time? Great professional application. Tech support is prompt and thorough. Worth every penny! I am new to Reyburn's tuner, but I love it already and it works great on the iPad - easy to see and fits on the top of the piano really well with the Apple cover folded up. The Smart Tune mode sounds so much better in the top and bottom octaves than my old tuning! 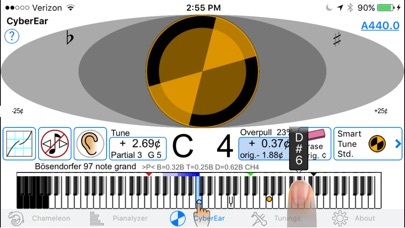 Worth every penny, the RCT is the best developed tuning app and the best software for piano tuning. I own them all. I use this app everyday and love it more and more. Concert smart mode is amazingly accurate. I'm glad they added historical temperament support. I have been using RCT and iRCT since the beginning. Every release keeps getting better and better. This latest release is the best! So many of my customers are interested in Cyber Tuning! I had a customer, that moved too far for me to keep them, call me and ask if the tuner they hired was good enough because they did not use an ETD. Bought the iRCT becuase my iPaq was getting worn out. Love it. It has saved me when my hotle clients think that it's OK to set up a banquet while I'm tuning. Great software. Easy to use and very functional for a professional piano tech. Also a very useful tool for preparing for the RPT exams. I've been a "CyberTuner" user for fifteen years. I finally upgraded to the Apple version and find it brilliant. It's quite user-friendly and accessible. I put off buying CyberTuner, but I have been very pleasantly surprised at how well this tuner works. The pianos I tune regularly are more stable, and it also gets good results with the pianos that haven't been tuned in decades. I'm also using it to prepare for the RPT tuning exam. The constant improvements are a real plus. Been using Sanderson for 27 years. The Cyber Tuner is very easy to use. Using both tuners side by side the Cyber has some very nice advantages. Great job to the the great minds that produced a wonderful product. Going to be fun detuning daily. I had the laptop software before this version for apple. This is definitely the gold standard for our industry. Makes tuning a joy! Thank you Reyburn for the fabulous iRCT app! Worth every penny! I love this this app. I use it on all pianos I tune. I used this same program for years before it was available on Apple devices. I like it even better now and I have it on my phone and ipad. 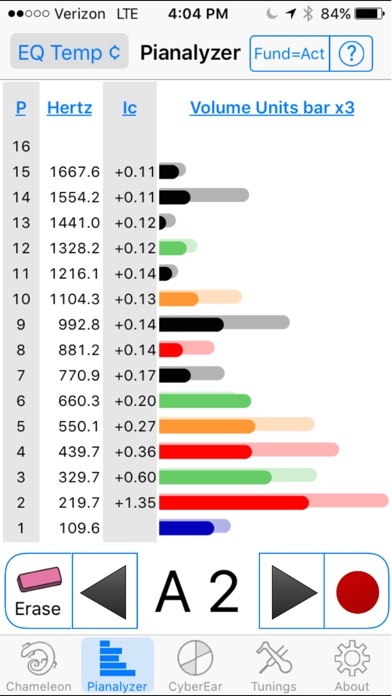 It's a very in depth and helpful tool to use in conjunction with aural tuning. And it can help with training for the PTG exam. This the most sophisticated piano tuning software in the world. I am biased because I know the developer. He is ahead of the tech curve constantly. He is always upgrading his app developer skills through Apple trainings. His tech team is top notch as are his beta testers. It works so well at the highest level of theoretical and practical applications. The "smart tune concert" feature is miraculous. Gotta get it! I've used Cybertuner since 2003 and the new platform has knocked my socks off. It's clear, fast, accurate. It stays lit and sits well in/on the piano with a rubber skin. I love the help icon. I'm using the iPod touch and am amazed at the battery life compared to the prct. Thanks. It has been worth the wait. 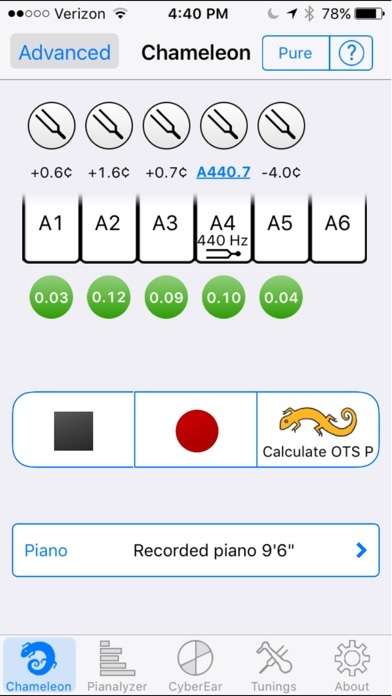 Whether it is a quick equal temperament on a home piano, a custom historic temperament on a 9 foot concert grand piano, or following a personal temperament sequence this app follows effortlessly. The pitch raising mode saves time and the exam mode lets you test yourself if you are holding up your professional level. I have used this on iPhone 5. Product support was prompt and professional when I had a question. I started using RCT with the Pocket PC version, and have always loved the program. The new platform is fabulous - very stable and an easy transition. Looking forward to getting all the old features developed, but still loving it. I've been using RCT, then PRCT since the mid 90's. iRCT has blown me away. 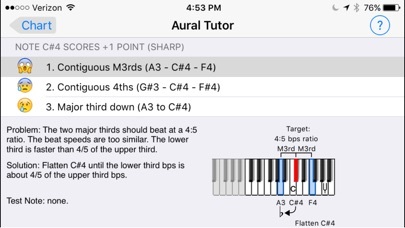 The integration with iOS is done to perfection, and it has made tuning fun again. Great job iRCT team! I've been using Cyber Tuner since Sony came out with a laptop. Doing concert work and personal work. You get a consistent job time after time. I've never had a complaint in all these years (except weather changes, always a challenge). The gold standard visual aid for professional piano tuning. The current update bumps it up another notch. Also nice to finally be able to input letters as well as numbers in the serial number field (especially handy for post 1988 Samicks). I have tried some of the best of the tuning platforms (TuneLab, AccuTuner, and Verituner). All of the tuning platforms will produce a good tuning but, the thing that sets Cyber tuner apart is they are continually making more significant improvements. I like the user friendly tuning graphics interface and support forum. 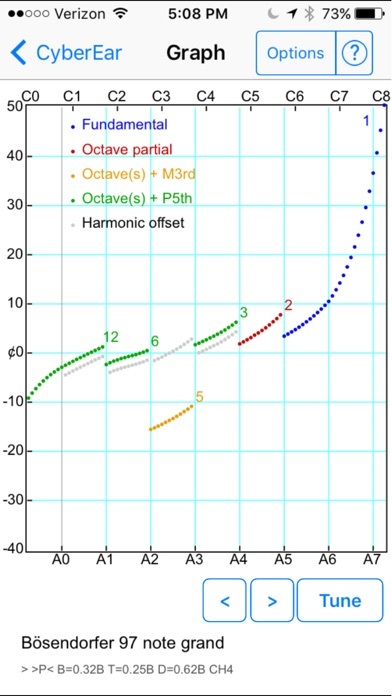 The tuning exam section, in my opinion is the best out there.